When treatment proceeds without goals, results often become goals. Our study group felt that a feedback mechanism is needed to reflect on treatment results we obtain; reasons for good results and causes of poor results. For this purpose, we predict optimal results for the treatment goals we set in each case and do treatment simulations to see how the results would look and whether the plan is workble. After treatment, actual results are compared against the prediction. This process has been repeated over and over for all these years in our study group. At every annual study club meeting, all participants present cases and have discussions on the diagnosis and treatment of each case for mutual learning. We strongly believe that the accumulation of these experiences over the years has greatly helped us enhance our diagnostic and treatment skills. An 11-year-old girl presented with crowding of teeth. The eruption of the second molars has been followed for two years since her initial visit. Treatment results are predicted before the start of treatment as mentioned earlier. In addition, growth prediction is also incorporated in children. 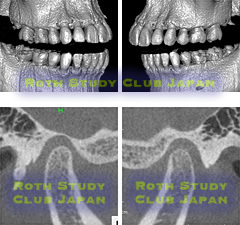 How should the teeth be moved to obtain optimal facial profile based on the pre-treatment facial pattern shown in Fig. A? Fig. C shows her predicted profile or VTO (red line) against the pre-treatment profile (black line). Fig. B shows a computer-generated image of the predicted profile based on the VTO. The lips are nicely retracted. The plan included the extraction of four bicuspids. Treatment was initiated according to this plan. Please pay close attention to the cephalometric tracings in Fig. C. You may think that the retraction of the lips is achieved with the retraction of the anterior teeth into extraction spaces. But the position of the anterior teeth or the lips remains relatively unchanged. Greater changes took place in the position of the molars and the mandible. The mandible rotated counterclockwise 2 degrees, bringing the chin forward and making the lips appear less full. Fig. B below is the predicted profile based on VTO and Fig. D is the actual facial profile obtained with treatment. Fig. E shows the superimposition of VTO (red) and actual results (blue). The mandible grew slightly more than predicted. 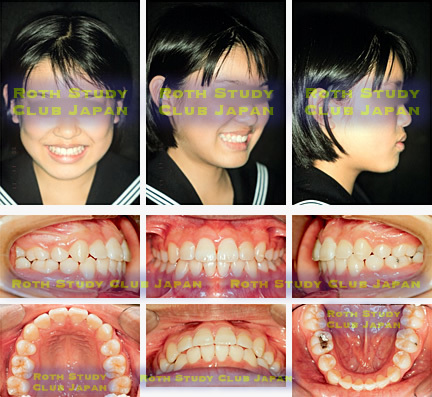 Her skeletal pattern indicated less mandibular growth at the time of diagnosis. More favorable mandibular growth than expected led to a balanced facial profile. 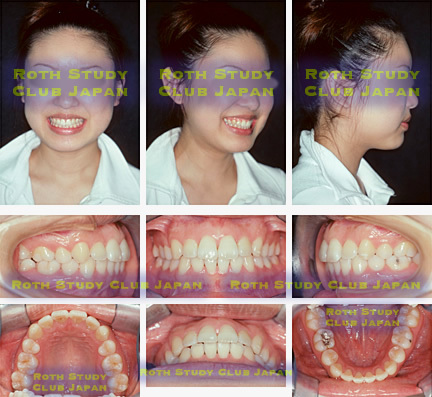 Even in less favorable skeletal patterns based on conventional orthodontic diagnosis, orthodontic treatment friendly to the joints may bring out the full potential of mandibular growth, as exemplified in this case. At the end of 2-year orthodontic treatment, esthetic alignment of the teeth was obtained along with facial profile improvement. Eight years after orthodontic treatment, the results remain stable, indicating that the TMJs are in harmony with the occlusion without excessive stress on the joints or muscles. She became interested in dentistry through the orthodontic treatment and went on to become a dental assistant. She has a great interest in the health of the TMJs and teeth. Her joint and alveolar bone status was evaluated with CT. All teeth are placed well within the alveolar bone. The joints were in good health. Placement of all teeth in the alveolar housing is conducive to long-term stability of the periodontal tissues. Orthodontic treatment influences 4 areas (TMJs, facial esthetics, functional tooth alignment and periodontal tissues) positively or negatively. Achievement of goals for each area will lead to optimal outcomes for each individual patient. Our group uncovers hidden problems through TMJ-first diagnosis, sets treatment goals for each of these four areas affected with treatment, selects optimal treatment mechanics for individual patients, and brushes up our skills by comparing actual and predicted treatment results on a consistent basis.